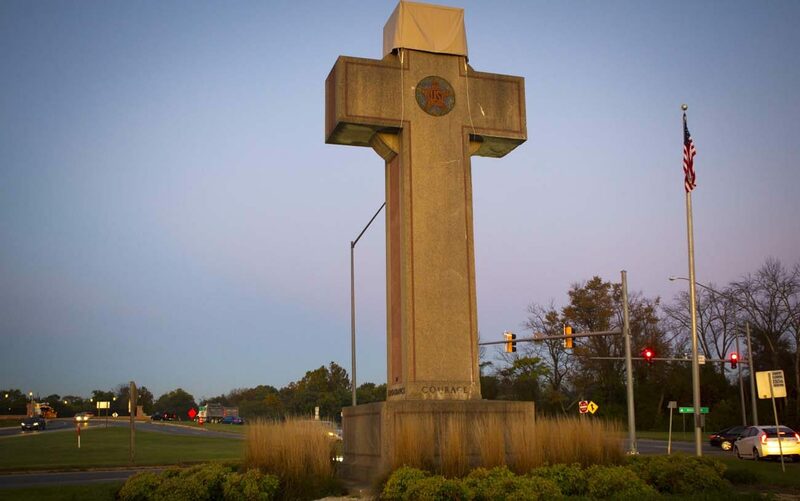 WASHINGTON (CNS) — A 40-foot-tall cross memorializing soldiers who died in World War I that sits at a busy intersection in the Washington suburb of Bladensburg, Maryland, is unconstitutional, a federal appeals court ruled Oct. 18. The monument “has the primary effect of endorsing religion and excessively entangles the government in religion,” said a 2-1 ruling from the 4th U.S. Circuit Court of Appeals based in Richmond, Virginia. The First Liberty Institute said the decision “sets dangerous precedent by completely ignoring history.” The group, which supports religious freedom, represented the American Legion, the defendant in the case, and plans to appeal. The ruling “threatens removal and destruction of veterans memorials across America,” Hiram Sasser, First Liberty’s deputy chief counsel, said in a statement. Known as the Bladensburg Cross or the Peace Cross, the cement and marble memorial was erected by the Snyder-Farmer Post of the American Legion of Hyattsville, Maryland, to recall the 49 men of Prince George’s County who died in World War I. The cross, whose construction was funded by local families, was dedicated July 13, 1925. The Maryland-National Capital Park and Planning Commission acquired the memorial from the American Legion in 1961. It is located at Maryland Route 450 and U.S. Route 1. The Washington Post reported that the state agency has spent about $117,000 to maintain and repair the memorial and has earmarked $100,000 for renovations. The American Humanist Association, a Washington-based group that represents atheists and others, filed suit against the memorial because it is in the shape of a cross. It argued that having a religious symbol on government property violates the establishment clause of the First Amendment. In his dissent, Gregory said the Peace Cross “has always served as a war memorial, has been adorned with secular elements for its entire history,” and added that sits near other memorials in Veterans Memorial Park. “(Its) predominant use has been for Memorial Day celebrations,” he wrote. The fact that in the memorial’s 90-year existence and 50-year government ownership, there has been no litigation until now “is a strong indication that the reasonable observers perceived its secular message,” he said. A bronze tablet at the base of the monument quotes President Woodrow Wilson: “The right is more precious than the peace; we shall fight for the things we have always carried nearest our hearts; to such a task we dedicate ourselves.” Also at the base are the words, “Valor, Endurance, Courage, Devotion.” At the center of the cross is a gold star. It appears that this Latin cross, erected in a time when we still believed our Country was founded in Christianity, has been perfectly fine for many, many years, until the almighty dollar sign became attached to it. Think outside the box – ask the local Churches for volunteers on a rotating schedule to come out and maintain the upkeep of the grounds and the Cross. The article indicates that local people, long ago, raised the money for the Cross. Undoubtedly, the families of those 49 Prince George County brave soldiers raised money. Why not go back into the soldier’s discharge paper, look for the little block that says “Christian” and tell the atheists that the Cross was for the soldiers, not them. If they don’t like it, don’t look at it. Meanwhile, we can pray for the conversion of them, and pray that those who voted for removal of the Cross have a change of heart. You can’t change history, and you can’t deny this country was founded on religious freedom. Let freedom ring. If you want to live in a religious state , move to the ISIS caliphate….